went up wednesday thinking about corn but the likely spots were still the same breakable crust as the rest of the hill. plenty of coverage and good ski compaction in the usual 30 ft wide corridor from the bottom of the shoulder to the base. I have a summer birthday and if I had coverage like this I would absolutely go up for a lap. you'll have fun even if you snowplow down from the top of the kitty. Eating my hopes for continued snowfall. Anybody done any digging? Seems like the warm temps haven't done too much damage? Cold front in a few days...come on now. Maybe we should have burned some fluorocarbons the other night. I was up in Mineral fork, yesterday. The snow is capped by a crust of variable strength and thickness, Support also varies. Point releases during warming were the only observed instabilities. Faceting not an issue. but how do you add a certification that requires proof of compitance with one that doesnt? My preference would be to end the emphasis on "hazard" rating. The terms are relative to the point of being almost meaningless at times. If it snows six inches and the wind blows, the "hazard" will often jump to considerable even though the pre-existing snow was stable, without weak layering. Managing the subjective "hazard" can be accomplished, for the most part, by ski cuts. 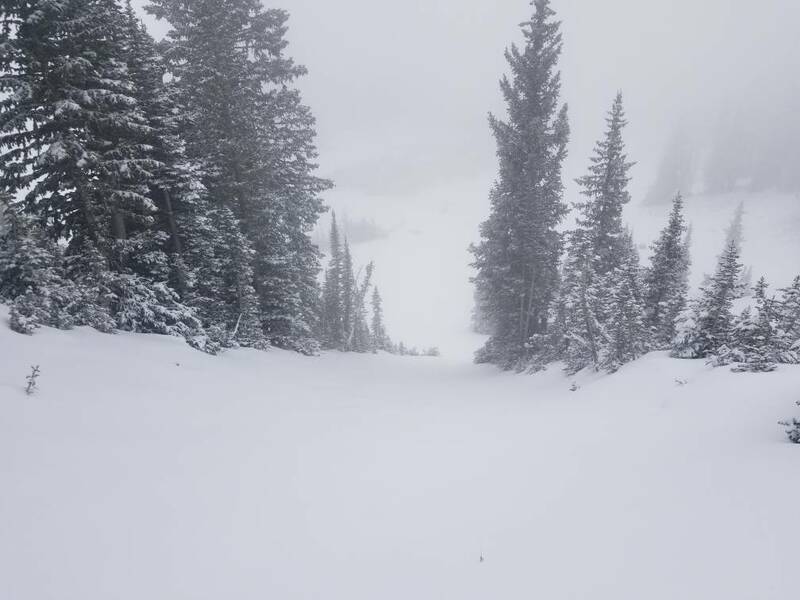 If it snows the same six inches with wind on a snow cover already burdened with load or persistent weak layering, the same "considerable" hazard rating is given even though conditions are much different and difficult to manage. The "hazard" and consequences of that hazard are greater even though the labeling remains unchanged. Same with the compilation of statistics. The eighties, for example, had low fatality rates, but the avi centers were lobbying for more money to keep those figures low. The nineties, fatalities rose, even with better funding, so damn, we need increased funds because people are dying. Weather and snow are the decision makers and recreators should learn how to manage based on those changes, not whatever someone decides the hazard is. when the more truthful metaphore is "you can go into a bar considerably full of guntoting pissed off redknecks mind your p's and q's behave and youll probably have a considerable chance of walkin out fine"
Thanks for the recap. Wish I coulda made it but was babysitting 3 furry friends and rolling pebbles around the resort. Sounds like another worthwhile USAW. Really like that Woody fellow. C'mon by...the pebbles are getting bigger! 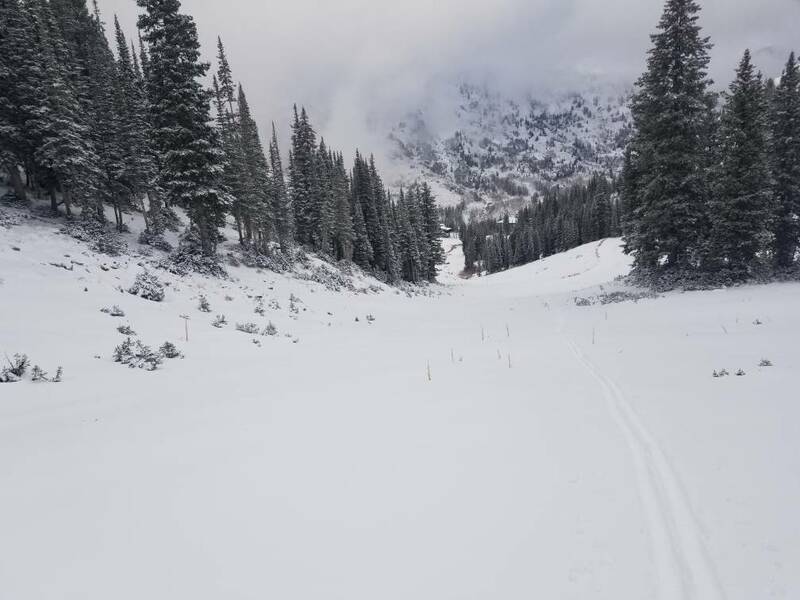 Took a walk up Alta today and found 6" of dense cream up top. Surprisingly fun turns! Hopefully these next few storms over-deliver as well. Last edited by Lone Star; 11-05-2018 at 06:39 PM. Isn't the Funland meadow higher than 8800'? oops.. that was supposed to be 1.5 inches between the crust layers. with this sunshine in the forecast construction may indeed start... on the bar and picnic table so we can drink beer and read a book until it decides to snow for real! Took a stroll up to tombstone trees on Sunday, Total snowpack is approx knee deep. Riding conditions on a stout crust. Toe - boot deep mostly. No instabilities noted. FNKA!!! So much stoke. Shout out to Conner who was heading up to main chute on his splitboard. Pic of the current snowpack. Season shaping up to be stellar, Day 5 done before thanksgiving. Tour was up collins and ski was off baldy shoulder. Saw about 10 people ski main chute and about 50+ people skiing down the collins groomer, must've ran the lift for sometime because the people I saw coming down were not the folks who looked like they could hike up. Snow depth was just about 120CM on NW facing baldy aspect. Cheers and pray for snow! Yeah skied pretty dang good yesterday up there. 4-5 inches. Definitely some questionable people hiking beyond Collins with kids and no gear. I don't think they were letting strangers ride the lift the past few days.....? What elevation was your Baldy pit? I dug a hole not too far below Main Chute and I can't imagine I saw much more than 60 cm on the ground, if that. If high boy and lone pine were that threatening to the base area groomers, they would probably also be threatening the buildings and parking lot, and thus be controlled. It probably wouldn't take a whole lot of walking up corkscrew to no longer look like someone who couldn't hike up. I drove through Alta's parking lot on Saturday afternoon on the way to using my free night at the Cliff. It looked like half the plates were out of state, first year dishwashers from the East gettin' after it. Anyone been up gw recently? Enough left for some early morning fitness laps? Dude, If your looking for work, I bet Snowbird would give you a job doing the mid mountain measurements. I got all the Alta beta, eh mall walker? Whose in for Brighton Opening Day? Going to be up there for some afternoon laps. Blue Blizzard Cochise and Purple coat if you catch me up there.